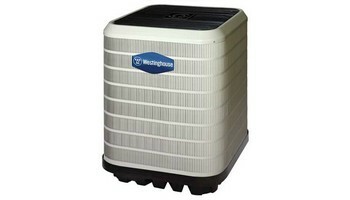 Westinghouse up to 25.5 SEER iQ Drive Ultra High Efficiency Air Conditioner The Westinghouse i Q Drive® Air Conditioner and iQ Drive Heat Pump utilize inverter rotary technology to achieve ultra-high efficiency levels. Traditional compressors just turn on and off – operating at 60 hertz when running. But i Q Drive inverter technology has almost infinite modulation for a perfectly even variance. It runs as low as 15 hertz, so it uses less power. So while today’s compressors kick on at full speed to compensate for a small change in temperature, iQ Drive inverter technology alters the compressor speed just enough to match the slightest change in air temperature. So in addition to minimal power utilization, you get a more consistent temperature level – and fewer hot and cold spots. The up to 25.5 SEER iQ Drive air conditioner and up to 22 SEER iQ Drive heat pump come with programmable communicating controllers. * As a secondary function, the iQ Drive system will control humidity in your home better than a traditional single-stage air conditioner. You can even set a target dehumidification level. Just know that the iQ Drive system is not a true dehumidifier, and in areas where precise control is needed, you should add a whole-home dehumidifier. Ask your Westinghouse contractor for details.You can program a seven-day comfort schedule to control up to four specific events at precise times of the day, such as wake-up time, work time, home arrival or sleep time. You can even set a vacation mode for ultimate energy efficiency even while you’re away.A “split” system is the most common heating and cooling central system used. Your split system air conditioner or heat pump is the outdoor component of a total system. The indoor component is a matched coil, which typically sits on top of the furnace or, in warmer climates, an indoor air handler is used. When you replace your outdoor system, it is extremely important to replace the indoor portion as well in order to meet energy efficiency performance and not void important warranties. Not changing your indoor component is like buying a new car and then placing old, worn tires on it. The iQ Drive® air conditioner is an excellent choice for geographies where maximum cooling efficiency is needed. In areas where heating efficiency is also desired, consider one of the iQ Drive heat pumps. They operate in the summer the same as an air conditioner, but also provide heat in the winter. And with an HSPF (Heating Season Performance Factor) up to 10.0, they’re incredibly efficient no matter what the weather.One-of-a-Kind: The unique operating capabilities of this air conditioner make it one of the most efficient air conditioners in the industry. This unit is able to modulate between 40% and 118% of capacity – making it not only quiet, but also able to reach 25.5 SEER.Operates at Quiet Levels: Your iQ Drive air conditioner will operate at some of the industry’s lowest sound levels – down to 59 decibels. Dehumidification Assistance: iQ Drive units are able to run longer at very low levels of capacity resulting in a more comfortable home. This increased home comfort is a result of dehumidification assistance and more even temperatures.Communicating Controller: Superior comfort is just a touch away with this unit’s iQ Drive controller. These innovative controllers allow for a fully programmable comfort schedule, maintenance reminders and troubleshooting diagnostics that can help you stay on top of your efficient system’s health.Exceptional Efficiency: Premium efficiency and peak comfort levels come along with eco Logic® rated systems.ENERGY STAR Rated: This unit is one of our most efficient products. It exceeds ENERGY STAR high-efficiency requirements in certain sizes and matches.Peace of Mind through Many Quality Checks: For ultimate peace of mind, this air conditioner is checked 144 times.